Den Braven South Africa is a wholly owned subsidiary of Den Braven Group, Netherlands. Den Braven South Africa imports the majority of its products from Den Braven manufacturing operations worldwide. The remainder of the products and accessories is sourced from partnerships with local suppliers. These products are warehoused in Johannesburg, Durban and Cape Town. The majority of Den Braven’s products conform to the Green Building Council South Africa. Their products are ISO compliant and conform to international norms. Den Braven supports waste management with its recyclable cartridges and packaging. It has achieved world recognition in sealant technology through its development of products for both general and specific applications, with several unique sealants in the range. State-of-the-art laboratories and equipment ensure that Den Braven products remain in the vanguard of sealant technology. Products are continually tested and evaluated for optimum functionality in specific climatic conditions, making them truly fit for purpose in any given country. Den Braven silicone sealants are materials of choice for industry and DIY users. 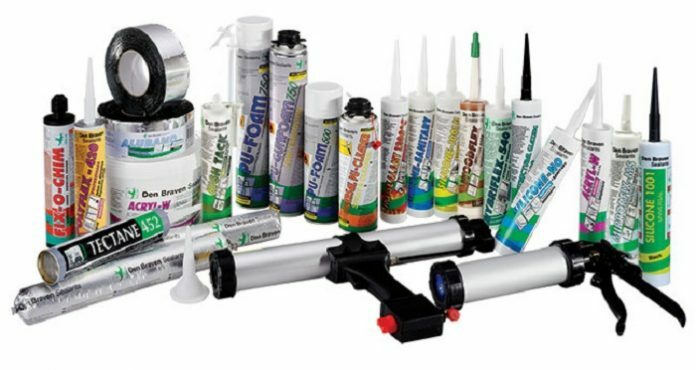 Acrylics, silicones, hybrids and polyurethane sealants, sometimes called RTV 1 (one component, room temperature vulcanisation) are used as adhesives, sealants, coatings, heat insulators and encapsulating material. Den Braven produces a range of high quality construction foams that meet B1, B2 and B3 standards. Widely used in the construction, sanitary, DIY and industrial sectors where high quality seals and adhesion with high joint movement tolerances are required. Den Braven South Africa exports and services the rest of sub-Saharan Africa from the Johannesburg head office. To provide quality service and grow this business, there is a dedicated customer service coordinator and an export representative in charge of this operation. They export to most SADC and sub-Saharan countries, among others: Botswana, Namibia, Swaziland, Zimbabwe, Malawi, Kenya, Tanzania, Ghana, Lesotho, Mozambique, Angola, Zambia, Democratic Republic of Congo, Mauritius and Indian Ocean regions. In these countries, Den Braven South Africa sells directly or preferably through local agents or distributors.